Self-topical neutral fluoride dentifrice containing 1.1% (w/w) sodium fluoride for use as a dental caries preventative in adults and pediatric patients. Prolonged daily ingestion may result in various degrees of dental fluorosis in pediatric patients under age 6 years, especially if the water fluoridation exceeds 0.6 ppm, since younger pediatric patients frequently can not perform the brushing process without significant swallowing. Use in pediatric patients under age 6 years requires special supervision to prevent repeated swallowing of the dental cream, which could cause dental fluorosis. Read directions carefully before using. In a study conducted in rodents, no carcinogenesis was found in male and female mice and female rats treated with fluoride at dose levels ranging from 4.1 to 9.1 mg/kg of body weight. Equivocal evidence of carcinogenesis was reported in male rats treated with 2.5 and 4.1 mg/kg of body weight. In a second study, no carcinogenesis was observed in rats, males or females, treated with fluoride up to 11.3 mg/kg of body weight. Epidemiological data provide no credible evidence for an association between fluoride, either naturally occurring or added to drinking water, and risk of human cancer. Fluoride ion is not mutagenic in standard bacterial systems. It has been shown that fluoride ion has potential to induce chromosome aberrations in cultured human and rodent cells at doses much higher than those to which humans are exposed. In vivo data are conflicting. Some studies report chromosome damage in rodents, while other studies using similar protocols report negative results. Potential adverse reproductive effects of fluoride exposure in humans has not been adequately evaluated. Adverse effects on reproduction were reported for rats, mice, fox, and cattle exposed to 100 ppm or greater concentrations of fluoride in their diet or drinking water. Other studies conducted in rats demonstrated that lower concentrations of fluoride (5 mg/kg of body weight) did not result in impaired fertility and reproductive capabilities. Pregnancy Category B. It has been shown that fluoride crosses the placenta of rats, but only 0.01% of the amount administered is incorporated in fetal tissue. Animal studies (rats, mice, rabbits) have shown that fluoride is not a teratogen. Maternal exposure to 12.2 mg fluoride/kg of body weight (rats) or 13.1 mg/kg of body weight (rabbits) did not affect the litter size or fetal weight and did not increase the frequency of skeletal or visceral malformations. Epidemiological studies conducted in areas with high levels of naturally fluoridated water showed no increase in birth defects. Heavy exposure to fluoride during in utero development may result in skeletal fluorosis which becomes evident in childhood. The use of Denta 5000 Plus in pediatric age groups 6 to 16 years as a caries preventive is supported by pioneering clinical studies with 1.1% sodium fluoride gels in mouth trays in students age 11-14 years conducted by Englander et al. 2,3,4 Safety and effectiveness in pediatric patients below the age of 6 years have not been established. Please refer to the CONTRAINDICATIONS and WARNINGS sections. Allergic reactions and other idiosyncrasies have been rarely reported. To report SUSPECTED ADVERSE REACTIONS, contact Rising Pharmaceuticals, Inc. at 1-866-562-4597 or FDA at 1-800-FDA-1088 or www.fda.gov/medwatch. Accidental ingestion of large amounts of fluoride may result in acute burning in the mouth and sore tongue. Nausea, vomiting, and diarrhea may occur soon after ingestion (within 30 minutes) and are accompanied by salivation, hematemesis, and epigastric cramping abdominal pain. These symptoms may persist for 24 hours. If less than 5 mg fluoride/kg body weight (i.e., less than 2.3 mg fluoride/lb body weight) have been ingested, give calcium (e.g., milk) orally to relieve gastrointestinal symptoms and observe for a few hours. If more than 5 mg fluoride/kg body weight (i.e., more than 2.3 mg fluoride/lb body weight) have been ingested, induce emesis, give orally soluble calcium (e.g., milk, 5% calcium gluconate or calcium lactate solution) and immediately seek medical assistance. For accidental ingestion of more than 15 mg fluoride/kg of body weight (i.e., more than 6.9 mg fluoride/lb body weight), induce vomiting and admit immediately to a hospital facility. 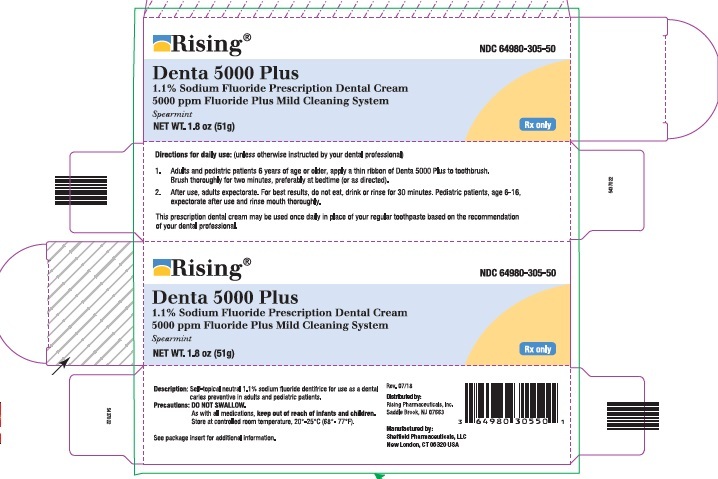 A treatment dose (a thin ribbon) of Denta 5000 Plus contains 2.5 mg fluoride. A 1.8 oz. tube contains 255 mg fluoride. 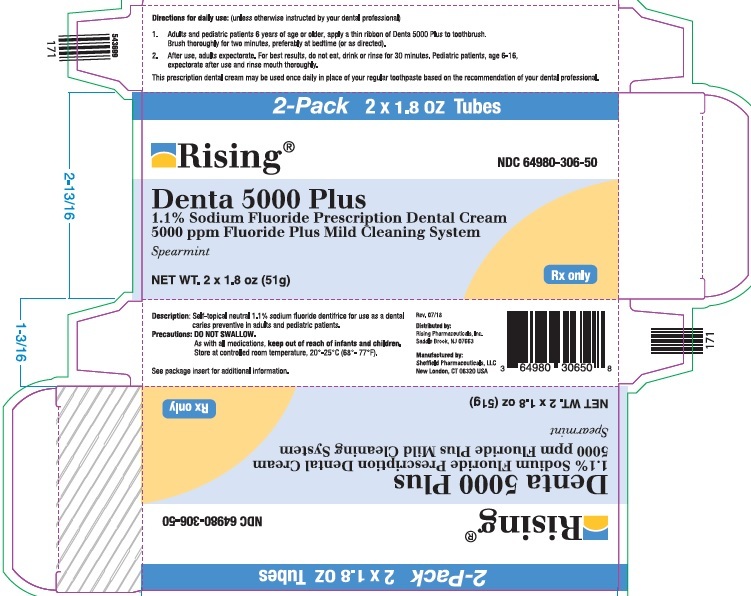 Adults and pediatric patients 6 years of age or older, apply a thin ribbon of Denta 5000 Plus to a toothbrush. Brush thoroughly once daily for two minutes, preferably at bedtime. After use, adults expectorate. For best results, do not eat, drink, or rinse for 30 minutes. Pediatric patients, ages 6-16, expectorate after use and rinse mouth thoroughly. Accepted Dental Therapeutics, Ed. 40, ADA, Chicago. P. 405-407, 1984. Englander HR, Keyes et al: JADA 75:638-644, 1967. Englander HR, et al: JADA 78:783-787, 1969. Englander HR, et al: JADA 83:354-358, 1971.